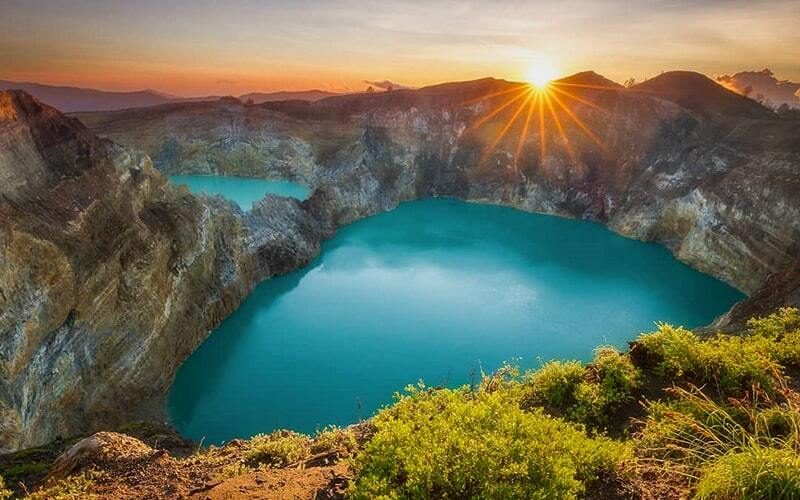 Kelimutu Lake is the three colored lakes on the crater of Kelimutu volcano in Flores, East Nusa Tenggara. The lake is exactly located at Desa Pemo in Kelimutu district in Ende regency. There are three lakes on the top of Kelimutu volcano which is commonly called by local Danau Tiga Warna (three colored lakes). Basically, the most common color is red, white and blue. But the colors have been changing at any time it will. According to the local people, the words Kelimutu are coming from the word Keli and Mutu. Keli means mountain, while Mutu means boiling. Each lake color has its own meaning regarding the Local. The red color is regarding the dead people spirit who has sins during their life. Blue is regarding the young people spirit and white is regarding the oldest spirit. The local native believe that when the color change, they will come up and give offerings to the spirit of deal people. Kelimutu Volcano is at altitude 5.377feet or 1.639mand. And wide of the area is 1.051.000m. Flight from Bali or Jakarta to Ende or Maumere. Pelni, big ship from Bali to Ende, 2 times a month. Getting to Kelimutu Lake has never been easier. All you need to do is book your Kelimutu lake tour from Labuan Bajo or Maumere. The other Flores tour packages can also find through the search box. Our professional tour guide always loves to accompany you along the way to the destination of your traveling. Kelimutu offers a stunning view of the three colored lakes. The best thing you can do on Kelimutu is having the sunrise. You will need to do soft trekking for 45 minutes to the top. Other you can do during the Kelimutu tour are such as visit some traditional village, beaches, and many more. Check also our best offering for the other Flores tour packages through the search box at home page.